Why is it so hard to let go of stuff? The statistics say it all. Perhaps we have a problem with keeping too much stuff? In the U.S., 65% of self-storage renters have a garage in their home, 47% have an attic, and 33 percent have a basement. This suggests that Americans have more things than their homes allow them. Over the past 40 years, the self-storage industry has proven to be the one of the sectors with the most rapid growth in the U.S commercial real estate industry. While 92 % of homeowners surveyed described their home as somewhat or very organized, one fourth of them admitted embarrassment with the garage and nearly one third said they keep their garage door shut so others won’t see the mess. There’s a problem with letting go of our stuff. In working with my clients, I find that there are typically 6 reasons why it’s hard to let go of stuff. Financial reasons hold people back. I could be that we purchased an item and we have not used it. Maybe it’s the clothes with tags on them in your closet or the beany babies that could be sold. If we think it’s valuable, we postpone the decision of decluttering since we are not sure to sell it or give it away. Attachments and sentimental reasons make decisions difficult. The item represents something special about a person, like your grandmother’s silver tea set. Will you be a “bad” parent if you throw away some of your child’s artwork? Are you the “caretaker” of your family legacy by holding onto your mom’s paperweight collection and can’t let it go? There’s feelings of guilt, shame, and vulnerability that are a part of the sentimental reasons that hold you back. In addition there’s grief bound up in our attachments. Loss can look like unemployment, divorce, broken relationships. Grief holds us back in paralyzing our decisions. With brain based conditions, such as ADHD, clutter can be paralyzing. In the ADHD brain, it’s hard to limit the amount of stuff and all things have possibility. There’s perfectionism and the thought there is the perfect system which eludes you. Because of working memory challenges, ADHD causes you to keep stuff just to remember about it. There’s impulsive purchases and difficulty prioritizing. Not only is accumulating clutter a challenge, but also the decisions to let stuff go is hard. We are busy! There’s seldom a time we have free time or will get around to organizing. It’s a low priority because we want to spend time doing what we love and with people we love. It’s easy to procrastinate about letting go and decluttering because we have so much to do each day. There are skills that we might not know to organize. Perhaps your family was not organized and you lived in much clutter. Do you wonder what papers to keep and what to let go of? Does everything have a “home”? Are items grouped together that are used together? There are key concepts to being organized. We attach our dreams to our stuff. We think we might have a special tea with our daughter and need those tea cups. Our family will be eating a special dinner together on each of those sets of dishes. There’s a shift going on, however. Essentialism, minimalism, relationships, and experiences are becoming the norm. Americans are re-prioritizing. The book The Life Changing Magic of Tidying up is a best seller. There’s many ways to recoup some of the money you spent. While you can’t recoup it all, there are many ways to sell your items. There’s Facebook sales and NextDoor to sell items to your neighbors. There are consignment shops of all types. In terms of donations, you can make a list and use this for a tax deduction. Is it time to process and find new perspectives about your emotional attachments and how let go of stuff? Without processing or new awareness about an attachment, we can get stuck. We can process with a professional organizer, coach, therapist or non-judgemental friend. How we process can make a difference. We can talk through the challenges, tell the story of the item, and acknowledge. As Brene Brown talks about in Daring Greatly, we can have a small ceremony or share a story about your stuff. Learn more about ADHD and other brain conditions to know what organizing is difficult. On ADDitudemag.com there are webinars, blogs and articles on decluttering. The book ADD Friendly Ways to Organize offers many ways to learn about ADHD and clutter. Podcasts such as Taking Control with Niki Kinzer offers support, tools and community for ADHD. We have to set a time to organize and set a time to organize routinely. Organizing moves up in priority this way. Write in on your calendar or set a digital date to declutter. What’s the best way for you to learn skills? Is it working alongside a professional organizer? Is it reading a book? Choose what’s best for you to learn and practice. Start a new awareness of why you have what you have. You might notice how many of an item you have which might lead you to think about what you are purchasing. Spend time assessing. Think about your home, your energy and your vision of your life. Is it time to assess your stuff? Click here to view the CBS Sunday Morning show, Clean Sweep. More tips and tricks on decluttering here! https://professional-organizer.com/WordPress/wp-content/uploads/2016/07/logo.png 0 0 Ellen https://professional-organizer.com/WordPress/wp-content/uploads/2016/07/logo.png Ellen2018-06-21 06:00:282018-05-13 18:00:12Why is it so hard to let go of stuff? This is why following through on the Organizing Continuum helps you live the life you imagined! Getting organized is a continuum, a work in progress, a journey not a destination, and a learning experience. In my work with clients, I see that there is a definite starting place for my clients that begins with organizing skills and new perspectives. Clients learn basic skills to help them get organized and be productive. I coach them to see new perspectives about themselves, their stuff and their time. I am thrilled to acknowledge their gains as they progress through the organizing continuum. If you are new to organizing, here’s how the continuum progresses. The time for the continuum depends on you. It’s the basis of all organizing. It’s the age old adage, a place for everything and everything in it’s place. All the items in your home or office need a specific spot. That’s where they are located, put back and retrieved when used. The first step in getting organized is having a place for everything. Yes, EVERYTHING. You can start by assigning a function to each room, what you need to do that action, the items needed, and then the storage of the items. Overall, each item will have a home and a place as a result. Not only does everything need a place, everything needs a time for it to be worked on, worked with or returned to it’s spot. You make breakfast, retrieve dishes and cookware, wash it and return it to where it was placed. If you are doing your taxes, you need to gather documents, work on them, then store these whether paper or digital. When you work, you go to your digital documents, work, and save it to a digital spot. All things, papers, or digital documents need time to work the work and store appropriately. There’s a place for your stuff, however it’s not worth the time to attend to it. This is when your discerning decluttering really kicks into gear. It’s not that you don’t have space for an item, how important is it to spend time getting it to where the place is? How many do you have already or do you need? Our time is the most valuable commodity we have and we can let go of items just so it’s not as time consuming to put them away. It’s not valuable enough to find the space for it. Here’s where you begin to assess a “just in case” perspective. Is the possibility of use a good enough reason to keep an item? The Minimalists have this perspective. If it costs less than $20, and you can get it in 20 minutes, do you need it in your home or office? Finding the value of keeping an item helps you move forward in this continuum. It’s about prioritizing your time and space. There are many easier ways to find the stuff you need. You have wrangled your stuff to get it stored and put away. Now you realize that there are many easier ways to find what you need, whether it is stuff, information or paper. You are entering the continuum where you start releasing more and bringing in less to your home and office. Living with less is rewarding. Life is feels less overwhelming, more about experiences, and you are living the life you imagined. Your life is about living, not about stuff. You stay organized because you know what is important to have and what to release. Congratulations on accomplishing the real goal of being organized! Sharing this continuum helps you start on your organizing and productivity journey! Here’s more posts to help you too! And join my newsletter to start on your organizing continuum. https://professional-organizer.com/WordPress/wp-content/uploads/2016/07/logo.png 0 0 Ellen https://professional-organizer.com/WordPress/wp-content/uploads/2016/07/logo.png Ellen2017-09-28 06:00:362017-08-26 11:28:23This is why following through on the Organizing Continuum helps you live the life you imagined! How can SMALL and BIG be used together for organizing? When we think of these opposites, can we use these together in getting organized? Well here’s how! Organizing and productivity are overwhelming. The most frequent question is how do I get started? Whether your view is a cluttered desk or home, it’s not clear where, when or how to get started. And what about the next steps? Is that starting with the small of units, like organizing your paper clips or the shoes in your closet? Or do you go big with the big stuff? Here’s answers to these 2 important questions. I love the question, how do I eat an elephant? Its the analogy I use most often in presentations. Of course the answer is one bite at a time! It’s in getting start in a small way that gets you started at all. It doesn’t matter if you take a nibble at the trunk or the foot, starting with a nibble gets you started. Your nibble in your home could be the junk drawer in your kitchen, the floor of a closet, the shelf in a linen closet or the papers in your kitchen. Nibbling can be an amount of time, like only 15 minutes. A nibble can be a number, like picking up 3 items to donate. Your office nibbling can be your inbox, a bookcase, or a file drawer. Decide what small looks and feels like to you then set a date on your calendar to commit. Look around at your home or office. What’s the big stuff in your way? We organizers call it macro organizing. Start with the big stuff when you keep on organizing. It’s not the time to launch into complex sort ing of your stuff. It’s also not the time to go to that shoebox full of small random items. Work on the big stuff first. Big stuff open up space. That’s the space you see and feel. It’s the big stuff that helps you break through being stuck and you feel the openness of your space. Take a big picture with your papers too. What are the big categories you can sort? Broad categories make it easier to work through tedious papers. Is this a new perspective for you? 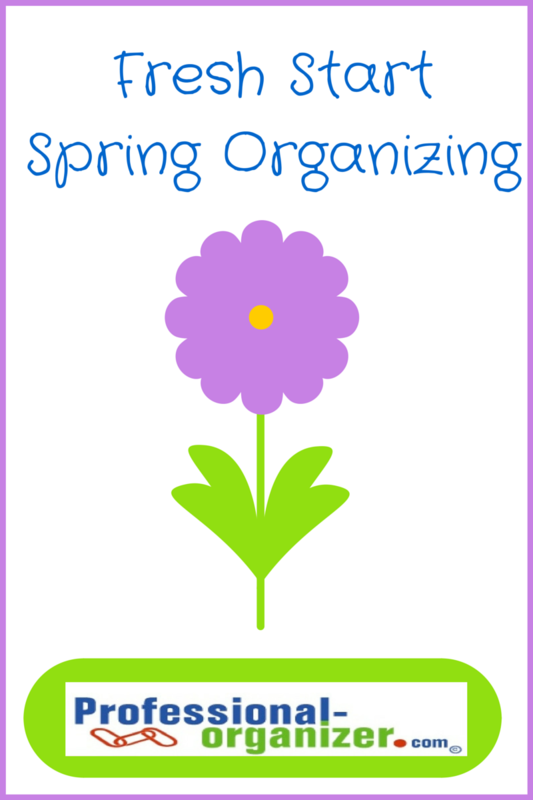 Have you thought you needed hours to organize and never started? Have you walked about from your papers after creating an overly complicated system? Here’s a new way to make organizing happen for you. Want to learn more organizing and productivity tricks? Join my newsletter here. For over 15 years, I have been sharing organizing mantras with my clients. These come out when we are working together on organizing and productivity. These also come together as I create presentations and work with virtual clients. These come from years of experiences, in a variety of settings, for organizing and productivity. I am sharing these here to help you on your organizing and productivity journey too. All your stuff takes a toll on your. You have to take care of it, put it away, make sure you have it, and make sure it works when you need it. That’s a lot of care for stuff. The more stuff we have the more stress we have on just how to take care of it. It’s hard to do, but less stuff means you have less stress. Structure is the way you set up something. It could be the way you set up a space, like a desk or a kitchen, or a day, like your schedule and calendar. It’s the way that we establish what’s around us that matters most. The impact of structure is that you set yourself up for success. The reason a little structure makes a difference is to keep you nimble. A little structure keeps you within a good working routine and complete chaos. Recently at home we had a small accident. There was sadness and, well, some blame. As I said to my family, people matter, stuff doesn’t. It’s a reminder that truly relationships are the most important part of our lives. The stuff we have either adds or diminishes relationships. Let’s make people matter the most. That’s not to say that taking care of your stuff isn’t important, however its important to keep it all in perspective. Planning in itself is not enough. It’s getting started and working your plan that makes the difference. If you tend to over complicate and make work too complicated, this is the mantra for you. It’s about choosing the most simple process to get the results you want. Hugs and happy organizing is how I sign my success notes for my clients. It’s that happy feeling because you are more organized and productive. 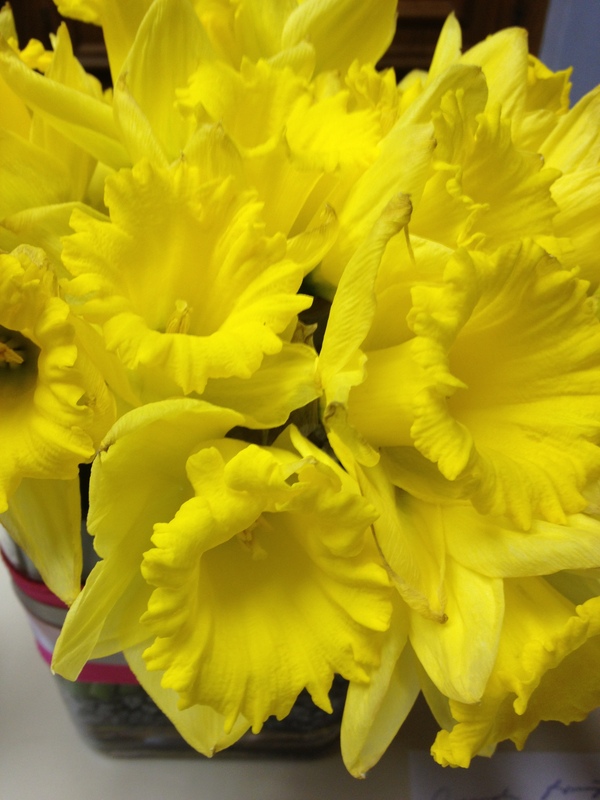 Check out lots of before and after successes with my clients in this Hugs and Happy Organizing category of Ellen’s Blog. I’d love to hear the mantras that inspire you to be more organized and productive. Add a comment here!